Need help identifying "England" EIT mark:- I have 4 of these plates that were left by my husband's first wife. She didn't want them and he believes that they belonged to her grandmother but isn't sure. I have searched several sites and cannot find this mark anywhere. 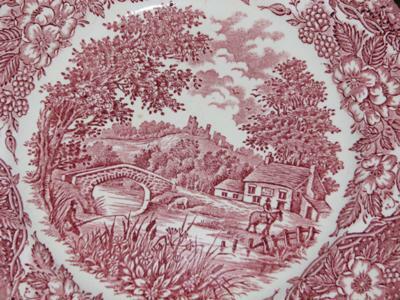 I have found similar patterns and they have been called lots of things but most commonly it is "England Red River-Red"
All 4 plates have the same pattern, but the depth of color varies from plate to plate. It varies from a deeper almost maroon to a rosy pink depending on the plate and the shading within the scene on each plate. 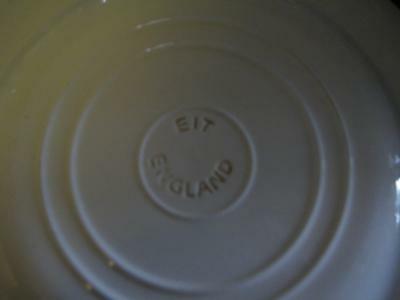 Three of the plates have the same imprint on the back that is a fancier "EIT" with the "ENGLAND", but one of the plates has a standard print "EIT" that matches the print on "ENGLAND". Any information about the mark and the pattern would be greatly appreciated. Many thanks for submitting, and hope you are finding the site useful. The first thing to say is I have never heard of or come accross any company called EIT before - and I have seen many different queries come through this website. I looked in my faithful Goddens encyclopedia and not a hint of this name. If it not in Goddens it normally means it is a very obscure maker or a more modern mark than the 1960's edition I have. It was not mentioned in Kovels either. - recently in and out of administration). I started digging around and firstly found a lot of EIT around for sale. I found it stood for English Ironstone Tableware Ltd of Staffordshire. Which got me no further forward at all. I saw one seller listed the items as being 1930's. I have my doubts - why would this firm not be mentioned in Goddens? One thing was common amongst the sellers - they didn't have a clue who EIT were and when the items were made. Then I began to find modern references to English Ironstone Tableware Ltd. They were mentioned in a recent report on industrial waste by Stoke-on-Trent local authority (dated 1998 to 2011). I also saw some versions of the mark with "dishwasher proof" on them. The thing is, not many companies have survived into the modern age without being part of a big group, and if they have, they are well documented in Goddens and Kovels as well as online. EIT seem to have appeared from nowhere, there is a lot of it around and it looks like Johnson Brothers production, there is no room in this market for new companies who aren't somehow backed by a large group. My guess would be EIT is a subsidiary brand of The Wedgwood group (or other business group) and made fairly recently. One way of finding out would be to ask Wedgwood, if you can find anyone left to answer your query. Other contributors please try to help out with query please, let's get to the bottom of it (check out the comments section below for replies). We bought a full set of the above at Bradlee's (an early Wal-Mart now out of business) in Keene, NH, in 1992. Everything from dinner plates to cups and saucers went for less than $50. Though cheap, the set was nice and we'd love to find cup replacements. Any further ideas? I purchased some of the EIT plates from England yesterday at a thrift store and they have blue flowers on white background. They only had a few but I loved the colour blue and the design. Would love to find more of these. Your information about EIT was very helpful. Thank you. About a year ago I bought a full set of "Blue Willow" that is all stamped EIT with England underneath. I bought it on E-bay and it is pretty but it was cheap. The seller didn't explain anything about the company and I haven't been able to find much. The seller did say that it was made in the 1960's. I came here hoping to find more information. I now know that everyone with the china is hunting the same information! Good luck everyone! EIT English Ironstone Tableware Ltd. I too was searcing for information on a plate marked English Ironstone and EIT. The next Google hit after this one gave me the following information. EIT = English Ironstone Tableware Ltd. was a manufacturer of ceramic items, in Manchester, England. It was incorporated in 1982 and dissolved in 2000. That is the most information I could find. Hope it helps anyone else searching for any information on this maker. There is (was) an item for sale on Ebay (230759668934) where the seller suggested a piece carrying the EIT/England mark was attributable to Charles Mason - he of the Ironstone patent. This identification was made by Boham's Auctioneers of Chester in the UK. The item itself appears to be a saucer in the "Parrot" design. I am sceptical as the Mason's marks are fairly well known via Godden and this does not feature. Good luck. I can't tell you anything about the English Ironstone Company (EIT) but I can tell you that their backstamp was very common in the 1960's on everyday wares. In about the mid 1960's, I worked in an English hardware store chain called "Timothy Whites" (taken over by Boots the Chemist in about 1966/7). One of the many things I sold on my counter (no 'serve yourself' back then!) was boxed sets of cups / saucers / plates for everyday use and these were often marked EIT. They were cheap and chearful and offered in many patterns - iconic 'modern' 1960's styles in bright colours (predominately blue, brown, orange - large stylised flowers) and willow pattern was also very popular. Just found 32 pieces of the red design in my mother in law's cupboard. My mother in law said no one wants them so we will give them to a nonprofit thrift shop. I to have some of the Blue Willow plates myself with EIT with England under it in my search I have found an artical online that states EIT is the "TRUE" Blue Willow English Ironstone Transferware made by English Artisians in the Historic Pottery District of Stoke On Trent (The Potteries)in the county of Staffordshire in England. EIT Blue Willow is handmade not machine made. The ironstone manufacture method is to expensive to manufacture today, EIT has closed it's doors and it's products are now collectibles. My mother bought a set of the blue pattern for me in the 80s. She had a cup of this pattern from a child's teaset that was her's, which would have been in the early 40's. I loved the little teacup. So when I was in high school, mid 80's our local grocery store had a "deal". For every so many grocery receipts, money amount, you could get a piece of the blue willow at a very decent price. She was able to buy me the entire set. Dishes for 8. And the hostess set, etc..... all the "extra" pieces. They all have the EIT mark on the bottom. My thinking is that its an inexpensive "knockoff" of the original Blue Willow that came from England generations ago. I still love and cherish my set, but Im sure its more sentimental rather than monetary value. I bought some stoneware plates with the EIT Ltd mark in a supermarket in Portugal in the 1980´s. The design is very small blue flowers on a white ground, they look like drawn with an ink pen. Later that same year the design was offered by Heine, a german catalog mail order shop, where I bought the set they offered. Beautiful though it is, EIT is not a vintage brand as some sellers in the internet and elsewhere claim. I still enjoy my set very much! It was handmade transferware ironstone, and was around for decades, but they closed, so there is no "new" EIT, though there is some that is more recent. THE PLATE I HAVE IS A BLUE SCENE ON WHITE, THERE ARE BLUE FLOWERS AROUND THE OUTER RIM WITH FOUR WHITE RIBBONED AREAS OPPOSITE EACH OTHER, THREE OF THESE RIBBONED AREAS HAVE WINTER OR WINTERE WRITTEN IN THEM AND THE FOURTH HAS HIVER OR HIVERE WRITTEN IN IT. THE SCENE IS A SNOW SCENE WITH COTTAGES IN THE BACKGROUND AND THREE MEN TO THE FOREGROUND WITH HELMETS ON THERE HEADS, THEY ARE CARRYING VERY LONG POLES,A COUPLE OF GOATS ARE WITH THEM, THEY ARE WALKING THROUGH SOME TALL TREES. HAS ANYONE GOT ANY IDEAS ABOUT THIS PLATE. THE HELMETS AND POLES GIVE ME THE IMPRESSION IT IS NOT AN ENGLISH SCENE. THE BACK OF THE PLATE HAS SOME SMALL AREAS WHERE IT IS NOT PATICULARY WELL GLAZED, THREE RAISED RINGS AT THE BASE WITH THE MARKINGS EIT ENGLAND IN THE CENTRE. WHAT DO YOU THINK, ANY IDEAS. I second the information given by the person who worked at an ironmongers in the 60s. I lived in England and this "blue willow" dinnerware was everywhere in grocery stores, ironmongers, flea markets, etc. The fine Blue Willow will be smooth and perfect and made by the major china companies. I have a 7" childs plate which has an adorable scene of bears playing at a picnic and enjoying honey. 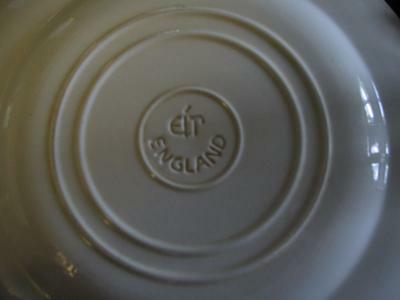 The center back of the plate has "EiT" and "ENGLAND" in a half circle underneath. I am curious about it's value??!! I worked there from 1979 to 1994 EIT is English Ironstone Tableware although there are some nice patterns it was mass produced second rate pottery . I just purchased a bread plate at Goodwill today (8-18-14) which has the EIT ENGLAND stamped into the pottery back. It was rather faint and took a magnifying glass to determine that it was "EIT" I was seeing. After reading here that EIT is English Ironstone Tableware, I went to Replacements.com's website. 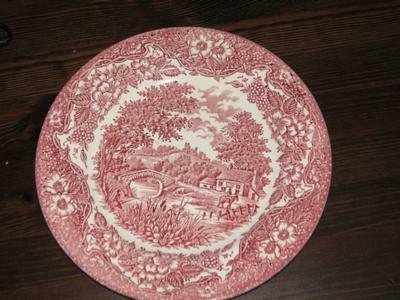 They have no listing for EIT, but DO have a listing for "English Ironstone" and when you click on that link, you get a whole page of patterns, including their version of "Blue Willow" which is exactly the pattern on the plate I purchased. Thanks to everyone else's comments to tell me what EIT stood for, I was able to find what I needed. I hope this info helps others who are on the same quest. I need to no if my eit willow dinner plate is worth if it is worth anything as I have no clue. English Ironstone Tableware Ltd (Hanley stoke on Trent)only operated between 1973 and 1994 when it went into liquidation.All ware had to be made during these two dates.So although this transferware looks to be older.It's not. Identified by number as opposed to a name. tableware, manufactured 1973 - 1994. I bought 12 dishes 8 were dark green and 4 were light green with Santa in a winter scene. I have searched and searched for this plate so I could add pieces to it. I bought them from a man who went regularly to England in the early 80's and brought back containers of English stuff that were wonderful. I bought from him for my antique shop i had then. I sold the 8 and kept the 4. I am collecting EIT the Castles serie. I found out there are many differant creamers and sugarpots, cups and saucers. The most older version with the ingraved EIT england , i bought in Germany and seamed dated before 1940. The second version is also mentioned staffordshire and the third version Castles. Both can also used for dishwashers. So these must be produced after the 1970. These Castles serie is in brown, green, red/pink, and blue. The dishes and bowls are the same prints and sizes. The saucerie is in different castle prints. I am also interested in a book about these serie, because there are so many differant pieces and when you collect these, you will have them all in your collection. Green and Red are often to find in Germany. Brown in Holland where i live. I have a whole set of very light pink chin marked eit ltd england on the back of each piece. They belonged to my grnadmother and probably from the 1950's or 1960's. I purchased a set of EIT England. There is a picture imprinted between the two markings. The pattern from what I can find is a picture of the city of London. There is no border trim on the rim of the plates.I would appreciate any information about this set.